As in other roguelikes, the player moves in a turn-based manner through randomly chosen static dungeons. 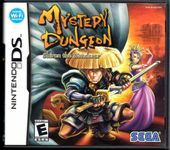 Although the player can save the game in various locations, dying resets Shiren's level to 1, sends him back to the first town, and all items not saved in warehouses are lost. The game's dungeons include a variety of settings, like caves and forests, and are randomly filled with monsters, traps, and items. In the DS version, if Shiren falls, a rescue request can be made through wireless networks or passwords. Another player can then go to the same area that the first player fell at and revive them. The rescuer receives a random item and, once revived, the rescued player can send a "thank-you letter" that may include a reward from the rescued player's own inventory for the rescuer. Once rescued, Shiren will still have his levels and items, and the floor will be clear of enemies, although others will appear as normal as he journeys. Shiren can be rescued up to three times; if he falls a fourth time, he will be reset as usual. Source: Wikipedia, Mystery Dungeon: Shiren the Wanderer , available under the CC-BY-SA License.